The species vary in size from small alpine plants up to 4 inches (10 cm) tall, to vigorous lowland species growing up to 10 feet (3 m). The leaves form a basal rosette at ground level and spiral up to the flowering stems. The blades are dentate or deeply lobed. The flowers of many species open in the evening, hence the name “Evening Primrose”. They may open in under a minute. Most species have yellow flowers, but some have white, purple, pink, or red. Most native desert species are white. One of the most distinctive features of the flower is the stigma, which has four branches in an X shape. 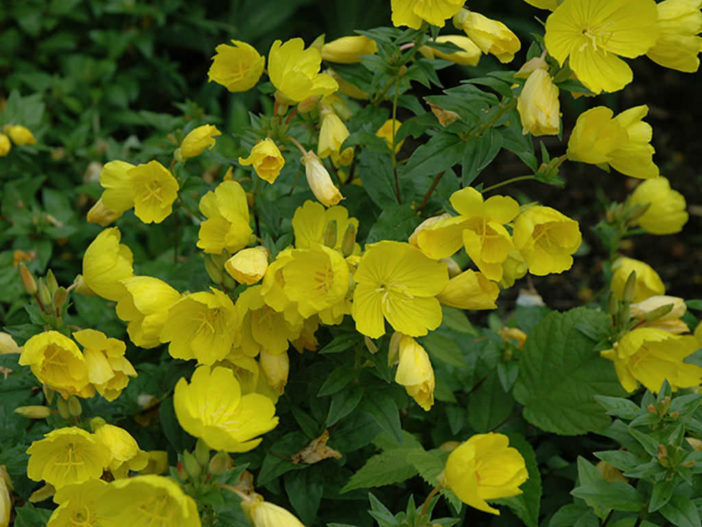 Oenothera is tolerant of dry and is a good candidate for xeriscaping. In really fertile soil the foliage can be robust, but fewer flowers form. Top dress with fully composted manure in the spring. Provide irrigation during long hot spells, and cut the plants back by a third after flowering to keep them looking neat. Hot summer weather may cause the plants to briefly stop flowering. Powdery mildew sometimes appears in humid conditions.